Myles was an active 6 year-old who one day, after falling while ice skating, had trouble getting his eyes to track together. A subsequent scan revealed a tumor near Myles’s brain stem known as a Medulloblastoma. Myles fought through brain surgery to remove most of the tumor and the standard protocol of chemotherapy and radiation. Following positive MRIs at 3- and 6-month post-treatment appointments, doctors discovered a new tumor, but not in the form of a typical Medulloblastoma reoccurrence. Myles was given more radiation targeting the new tumor and additional chemotherapy in preparation for stem cell collection. Myles then endured high dose chemotherapy and a stem cell transplant. The day after his 9th birthday, an MRI showed two new tumors. At this point Dr. Foreman went back to retrieve information from the Micro Array Chip of Myles’s original tumor that had been placed 2 ½ years earlier. Armed with new knowledge about what might work to combat Myles’s metastatic tumors, doctors started Myles on a new medicine called Cetuximab. Due to the combination of this medicine and more radiation, Myles continues to have clear scans. He is 6 years cancer-free and is focused on high school and looking forward to discovering what future career lies ahead of him. MAF Impact: Myles has had relapses of metastatic Medulloblastoma which previously had been rapidly fatal in all children. 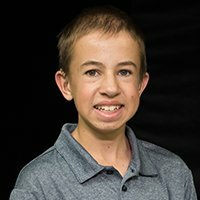 Development of new therapies discovered through brain tumor analysis funded by The Morgan Adams Foundation has enabled Myles to survive these relapses.